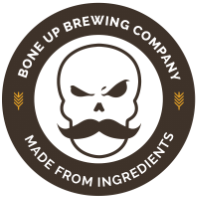 Stats: On-On - Bone Up Brewing Co.
Music Pairing (Jared's Choice): probably one of those terrible ska songs that Ben is always listening to. Best Occasion to Drink: Drinking a bunch of beer counts as "carboloading," right? Brewers' Notes: We just can't get enough grisette these days, so we brewed up this light 'n bright session saison with silky oats and a fistful of specialty malt, then dry hopped it with Galena for a tropical punch.